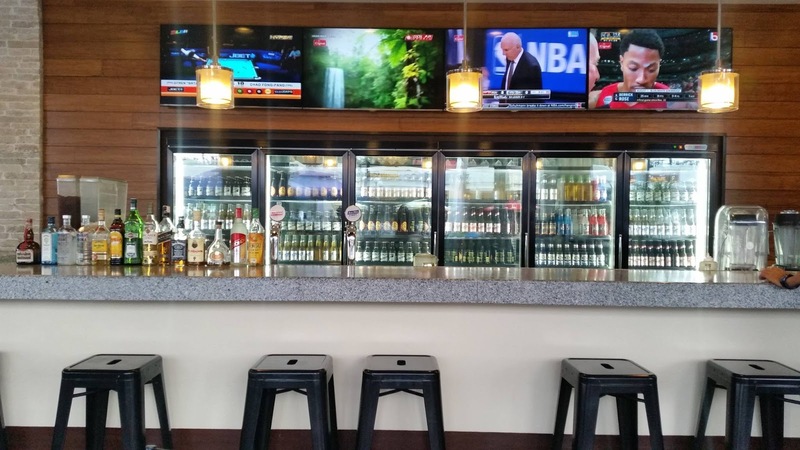 From a quaint space in Katipunan to branching out to different locations in the country, Dencio’s Restaurant and Bar is successful and at its prime twenty-six years after. It started with a vision to bring to barrio to the city a restaurant that serves great Filipino dishes. After almost three decades, Dencio’s emerged to be one of the most well-loved Filipino restaurant and bar, certainly, a household name. 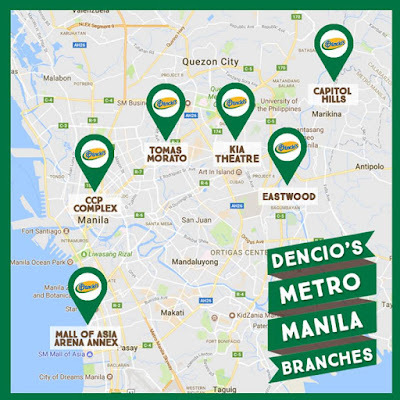 The team behind Dencio’s, works hard in enriching its menu and services to ensure the availability of a wide selection of nothing but the finest Filipino cuisine for its customers. Its Krispy Sisig has always been one of the best-sellers, and undoubtedly, a trademark of Dencio’s because of its rich distinct flavor and perfect crispiness. It goes well as a pulutan or appetizer and can also be paired with rice as a full meal. “Basta Krispy Sisig, Dapat Dencio’s” has been the mantra of sisig lovers crowding the restobar. Other classic Pinoy recipes served at Dencio’s are Sari-saring Sinugba, Krispy Pata, Kare-Kare, Calamares, Sinigang na Tiyan ng Bangus and a whole lot more. 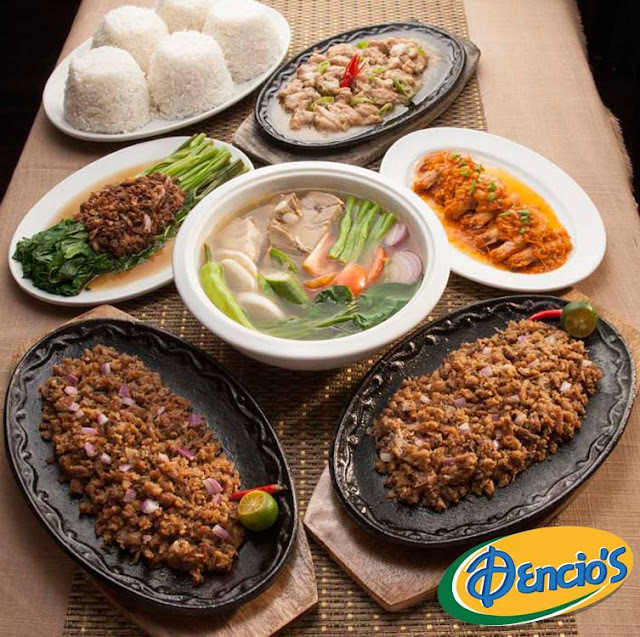 It is not surprising for Dencio’s to remain in the industry for twenty-six years because of these sumptuous all-time favorite Pinoy foods which make customers keep coming back. Through the years, Dencio’s has been efficient in providing high quality products and services that are affordable and worth every penny. “Dencio’s thrives because of the team’s effort to keep up with the times without having to compromise what was envisioned twenty-six years ago which was to serve excellent Pinoy dishes. We embarked on the journey of embracing a new store concept to improve the restaurant and be able to cater to the demands of its growing market, and still maintain our identity”. said Chief Operating Officer, Gretz Rivera. Dencio’s has captured families, friends and colleagues who are fond of sharing precious moments in a candid, chillax way. It has a laid-back environment that makes the dining experience more comfortable, spot on for winding down over great food, and thirst-quenching drinks. Its branches are big enough to accommodate guests in groups and has space for all sorts of functions to celebrate one’s milestones or simple get togethers. Dencio’s values what customers want when looking for a place to celebrate or to hold an event. This is the reason why Dencio’s always comes up with flexible group offerings and various promos that would suit the requirements and budget of its customers. 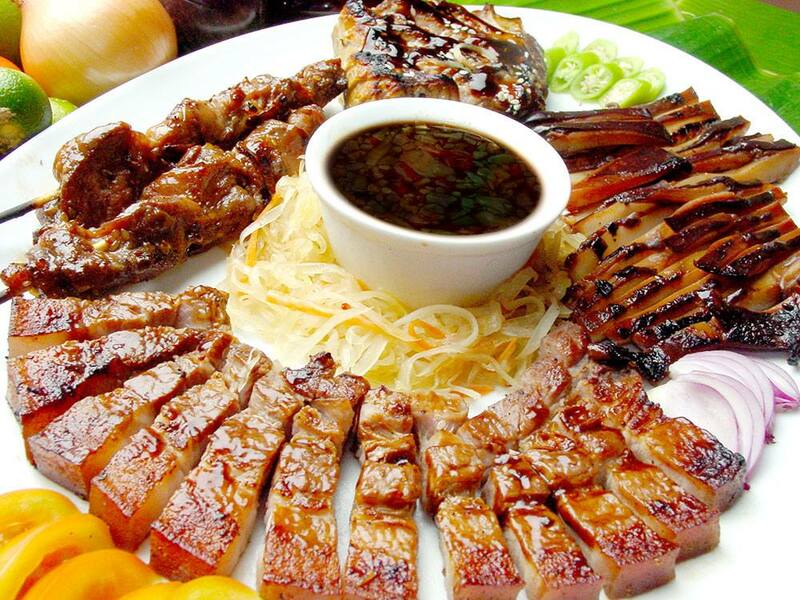 Majority of its dishes are served in large portions perfect for sharing. From appetizers to main viands, desserts to pulutan, Dencio’s has it all. It also serves alcoholic beverages moderate enough for social drinking. At Dencio’s, customers also have the option to reserve a private function room or a spot inside the restaurant or in its outdoor setup (for some branches). Dencio’s has always been an inviting place to go to because of its vibrant and lively atmosphere. Welcomed by its well-trained and friendly staff, diners will instantly feel the good vibes circulating at the restaurant and bar. Special features like huge television sets, acoustic bands and quiz nights also add up to a more entertaining hangout. 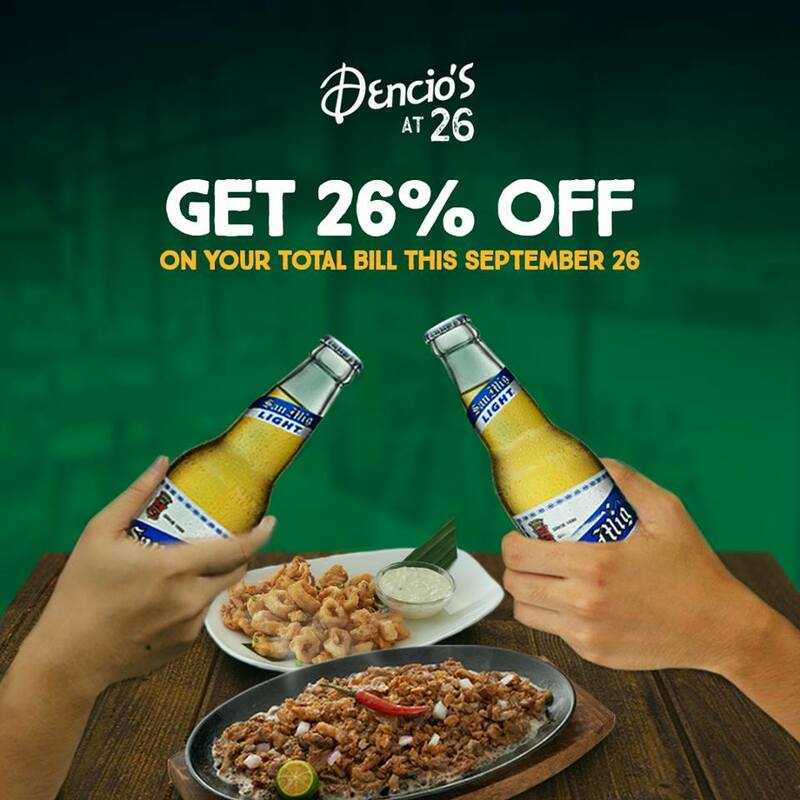 Dencio’s strongly recognizes that it owes its success to its valued customers and to show gratitude for the twenty-six delicious years shared together, Dencio’s is thrilled to treat its loyal patrons to a 26% discount of the total bill on September 26, 2017. Customers deserve this special “thank you treat” for being with Dencio’s from the day it first opened its door up to the present. 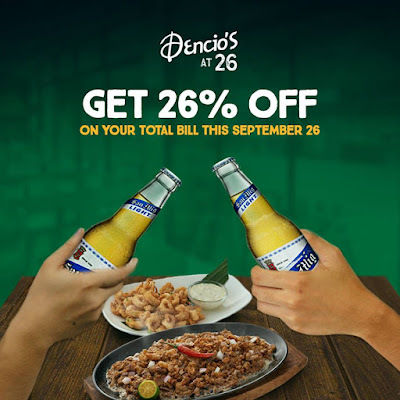 Indeed, this is a big savings to the budget so head over to the nearest branch of Dencio’s and take advantage of this anniversary giveaway. Dencio's 26th Anniversary Promo is available in the following branches: Tomas Morato, Harbour Square, KIA Theatre, MOA Arena Annex, SM Baguio, Capitol Hills, Bauan, Batangas, Eastwood, Tagaytay and La Union.